Interface:Socket for connecting fetal's FHR, TOCO, and Fetal Movement sensorSocket for connecting mother's ECG, NIBP and SPO2 sensor.Net Socket(RJ45) for communication cable with Central Monitoring Station Sofrware. Trend Graph:Resolution from 1s, 5s, 10s. Maximum time 96 hours. Trend Table:Resolution from 1s, 5s, 10s. Review up to 1000 items. Alarm:Ajustable High and Low limits. Three level audible and vistual alarm. User Configuration:All the color of parameters and waves can be set according to user's willing. 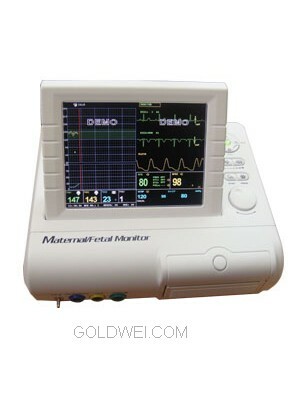 -> Interface:Socket for connecting fetal's FHR, TOCO, and Fetal Movement sensorSocket for connecting mother's ECG, NIBP and SPO2 sensor.Net Socket(RJ45) for communication cable with Central Monitoring Station Sofrware. -> Trend Graph:Resolution from 1s, 5s, 10s. Maximum time 96 hours. -> Trend Table:Resolution from 1s, 5s, 10s. Review up to 1000 items. -> Alarm:Ajustable High and Low limits. Three level audible and vistual alarm.